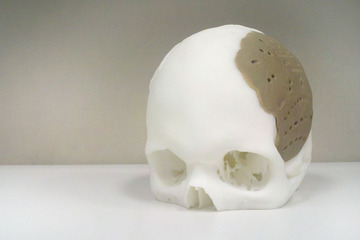 The applications of 3D printing increase everyday. This is most evident in the medical field. The ability to turn scanned tissue and bone data into stl files has led to an explosion of applications. The material is a special polyetherketoneketone with small feature surface details that encourage the growth of cells and bone atop of the plastic.